So today is my birthday, but not just any birthday: I’m 20 years old. I’m entering my second decade. That’s a weird thought, it really is. But it’s interesting how far I’ve come in the last decade. When I was 10, I never talked to anyone that wasn’t my family and a friend or two, never really spoke up in class and dreamed of making it big. A full 10 years later, I’m in college, double-majoring in literature and writing, have quite a lot of friends (some of whom are quite excellent bloggers), have gotten pretty close to some professors, become a semi-professional Internet writer (more on that later) and, weirdest of all, I have this blog: a place where people actually read what I have to say. Thank you, everyone who reads tomtificate. The cool thing about being born at the end of November is a few days before is Thanksgiving, which means awesome food and family, of course, but also means getting a few gifts from my relatives: when I was younger, that meant Transformers, but nowadays it generally means checks or Barnes & Noble gift cards. I’m not complaining, mind. Anyway, besides all that, I also have my own family’s tradition of the birthday box to look forward to. See, my family has this box and when someone’s birthday is coming up, we buy gifts to put in it and, starting 9 days before and ending on your actual birthday, the birthday person opens one gift a day. This year, I got this Avengers water bottle (I had a Trek one at the start of the year but it vanished like these things do) the first day and this AWESOME flat cap on Thanksgiving itself–I would show you what it looks like on my head, but my webcam program is being finicky at the moment. You’ll just have to imagine it. 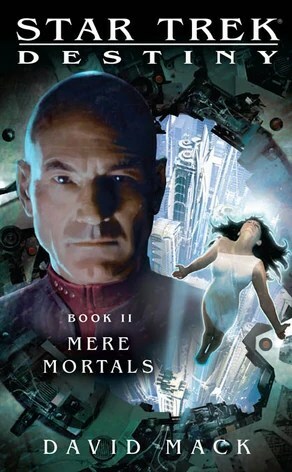 My parents also got me my first ever Star Trek novels: specifically, David Mack’s Destiny trilogy that brings characters from TNG and Deep Space Nine into the story of an ancient mystery being uncovered at the same time the Borg are launching a massive MASSIVE invasion. 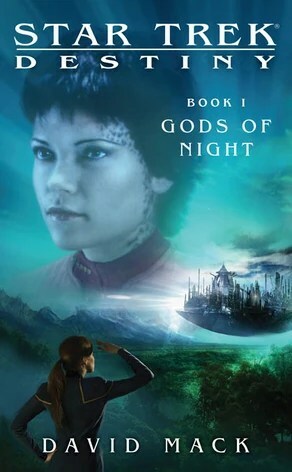 I’ve finished Gods of Night already–review will be next week–and am halfway through Mere Mortals. 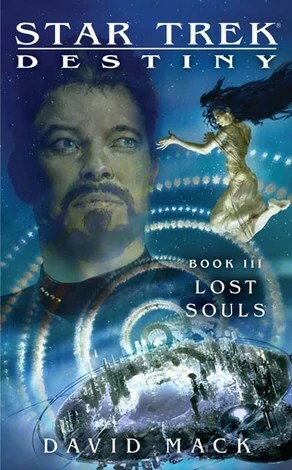 Mack’s writing isn’t just good Trek writing; with his knack for gripping prose and building character depth, it’s good sci-fi, period. Taking the rest of the gifts back to Calvin (the name of my school) with me, I opened one a day and they were: some candy, a little one-eyed monster doll thing that my roommate named Pistachio, some giant sticks of beef jerky and two more books, Michael Barrier’s The Animated Man: A Life of Walt Disney and David Michaelis’ Schulz and Peanuts: A Biography. I’m farther in the latter than in the former, but I’ve wanted both of these books for a long time: Michael Barrier is the premier animation historian working today (his website is awesome, and you should read it) and while I’ve used my library’s copy of this book for research, I’ve never sat down and read it. The second book is the official biography of iconic Peanuts creator Charles M. Schulz and Michaelis was honored for his 7 years of work with near universal acclaim. Look for reviews of these. So yeah, pretty nice way to celebrate my 20th, books and candy. I also get to hang out today and a good part of this weekend with the group of college students and professors I traveled with to Massachusetts to study 19th-century literature last year; they’re some of the awesomest people I’ve ever met. I love these guys! So yeah, not much else to say really but thanks to all who have been checking this blog and commenting, even linking and liking. Thanks a lot, guys and I’ll try to be worthy of your attention in the days to come. So the reason there was no Wednesday post is because I was too busy seeing one of the top bands of the moment, fun. at Calvin College–where I go–in the Van Noord Arena last night. If you’re like me, you’re probably so sick of hearing this song on the radio every 5 minutes. And this one every 10 minutes. I tend to skip past whenever I hear them, but if I have to, I’ll leave it on. I’ll say this for the three-piece known as fun. (Yes, the period is part of the name.) They know what pop music used to be. They remember the days of Queen, The Rolling Stones, The Replacements and the glory days of power pop, and they fuse that through a post-Panic! At The Disco and Kanye West sensibility. They’re unapologetically earnest and real and it’s a very admirable thing. Also, they put on a HELL of a live show. It was the biggest show I’ve ever been to and certainly the loudest. I mean, we’re talking columns of speakers here. It was nuts. The opening band, some indie group called Miniature Tigers, were pretty good, although I’m guessing the sound was mixed more towards fun. rather than their particular jangly guitar-rock type sound. It was a bit of a shame that they sounded washed out because otherwise, they were quite good. fun. of course, if you haven’t figured it out by now, was pretty phenomenal. The 3 members plus their touring band worked in perfect sequence with the lights and the crowd to make things thrilling. That Stones comparison is somewhat appropriate both because singer Nate Reuss kinda looks like a young Jagger and embodies that cocksure strut and the band actually covered “You Can’t Always Get What You Want” with a trumpet and everything. It was pretty damn awesome. Bottom line: I’m still not totally on board with fun., I’m not a super fan, but I’m more impressed by them than ever and it’s awesome that there’s a band like them around in this age of Katy Perrys. If you want to read a more detailed review of the concert, go read Jon’s post over at Memoirs of a Culture Stalker. Bye now! It’s time for Star Trek Saturdays #8! This week’s episode is another legendary one, “Balance of Terror.” It’s legendary not only for being the first appearance of Trek mainstay baddies the Romulans, but also considered one of the best episodes of Trek, period. But let me unpack things a little, first. The phrase “balance of terror” refers to the wary peace between the United States and Soviet Union after WWII in light of the fact that both countries had vast amounts of nuclear weapons stockpiled and both wished to avoid all-out nuclear war. John F. Kennedy, in his 1961 inaugural address, used the term when he said that both the USA and USSR were “rightly alarmed by the steady spread of the deadly atom, yet both racing to alter that uncertain balance of terror that stays the hand of mankind’s final war.” (Full address is here). Suffice it to say, this episode’s title is an apt one, as it depicts a conflict that both sides, Enterprise and Romulan, want to avoid, but cannot. Now another point about the ’60s: when most people hear the word 1960s, they usually think of hippies, the Civil Rights Movement and the Countercultural Revolution. And all of those things are important, sure. But there was another side to the ’60s: that of the USA as an uncertain global superpower, struggling to deal with the threat posed by Communism, leading to the Cold War against Russia and, in 1965, when this episode was first broadcast, beginning to deploy combat units in Vietnam in a conflict that was already a decade old at that point. That’s the era of global history that this episode offers–a snapshot of its time–and it does so wonderfully with a gripping plot, fearless acting and ingenious staging. The episode opens with Kirk, Scotty & several crew members in the ship’s chapel, about to witness the wedding of 2 crew members who serve in weapons. Kirk begins his speech–which, incidentally, was repeated by Captain Picard in the Next Generation episode “Data’s Day”–but is interrupted by a warning siren; he’s notified by the bridge that two of the Earth Outposts along the Romulan neutral zone have been destroyed and a third is under attack. Once on the bridge, we find out through the magic of exposition that the Netural Zone between the domain of Starfleet and the Romulan Empire was established after the Earth-Romulan war a century before. Spock explains that, as the war was fought on primitive ships and viewing capabilities weren’t around yet, and no prisoners were taken, the entire war and the subsequent treaty were conducted without either side never seeing what the other looked like. Add to that the fact that the Romulan ship–or Bird-of-Pray–has a cloaking device that conceals it at all times except when it fires its weapons and this is one doozy of a conflict. The stakes get higher when Uhura picks up a communications signal and Spock is able to tie into it and enable the crew to view the bridge of the Romulan ship. 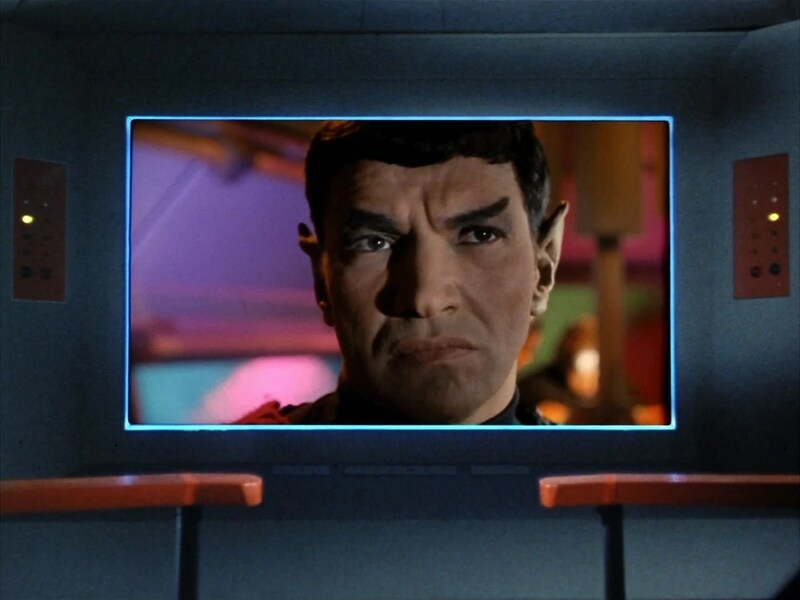 And they find, to their amazement, that the Romulan Commander (Mark Lenard) bears an astounding resemblance to Spock. Both Wikipedia and Memory Alpha inform me that episode writer Paul Schneider was heavily influenced by submarine films like The Enemy Below–remember, this is long before Das Boot–and that tense spirit shows, with the Romulan Bird-Of-Pray acting as a submarine and the Enterprise as a warship on the hunt. The way director Vincent McEveety stages things, keeping a tight view of the principal players on both sides, along with the genius placing of Fred Steiner’s terrifying score, really keeps your attention. But like any episode of this sort in television, the cast has to hold it all together and they do wonderfully. Kirk, Spock & McCoy have a wonderful scene in the briefing room as the man caught in the middle (Kirk), the attack-ready military strategist (Spock) and the cautious one (McCoy) and Bill Shatner, Leonard Nimoy & DeForest Kelley make us feel the strain between them beautifully. For the first time, it seems we see all of Kirk from the taciturn captain to the world-weary soul pondering just what is the right thing to do. But special mention must be made for Mark Lenard. First off, he underscores the word Romulan with his visage; he looks every bit like he could have just been performing as Shakespeare’s Caesar. Second, he manages to be, like Kirk, both completely exhausted by combat, yet still devoted to his duty as a military commander. Thirdly, he makes us feel for him and his viewpoint, in spite of the fact that he and Kirk never even see each other until the end of the episode and even then, not face to face. It’s brilliant, hands down. As other Trekkies out there no doubt know, this isn’t Lenard’s first appearance on Trek. He shows up as Spock’s father Sarek in season 2, a role he later reprised in three of the films and The Next Generation, as well as being a Klingon captain in Star Trek: The Motion Picture. I can’t wait for him to come back. This is one of the most famous episodes of Trek in history and it’s not hard to see why. It’s a brilliant hour of drama that had resounding implications for viewers watching it in the ’60s and maybe even today. Recommended without a second thought. It’s time for Star Trek Saturdays #7! This week’s episode is “Charlie X” and this is a milestone in Trek history, as it is the first script credited to the legendary Trek writer D.C. Fontana. Dorothy Catherine Fontana originally started out working as Gene Roddenberry’s secretary but was promoted to writer later on, with this being her first credited episode, working from a story by Roddenberry. Writing under the name D.C. Fontana–as well as various other pseudonyms–she wrote 10 episodes of Trek as well as various other episodes of spinoffs and even cowrote The Enterprise Experiment comic book miniseries, which she considers to be Year Four of the Enterprise’s five-year mission. She’s a bit of legend in Trekkiedom and this episode, despite some problems, shows why. 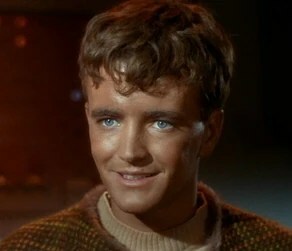 The plot of “Charlie X” has the crew taking on a castaway, a 17-year old boy named Charlie Evans (Robert Walker Jr., who, like all teenagers on American TV until recently, was 20-something at the time of filming), who was marooned on the desolate planet Thasus at a young age when the spaceship he was on crashed, and was apparently alone, teaching himself to speak using the ship’s resources ala Tarzan, until the Starfleet freighter Antares discovered him. They transfer him to the Enterprise so that they might take him to his only known relatives on the planet Colony 5. A nice thing Fontana does here is give us more than we’ve ever seen of the Enterprise and its crew. The rec room scenes and a scene in the gymnasium show us a whole bunch of extras just hanging out, really making this ship feel populated. That scene of Uhura singing while Spock accompanies her on what’s apparently known as a Vulcan lyre (so says Memory Alpha) is nice too, showing us a side of the two crewmen we haven’t seen before and it shows viewers just WHY Roberto Orci & Alex Kurtzman hooked those two up in the 2009 film; they have a great chemistry together and Uhura isn’t afraid to make fun of Spock. Walker Jr. is pretty good here as the tormented Charlie, but he really hits his stride in the last 15 minutes or so, showing us exactly what it would be like to have to deal with all sorts of power at the same time you’re going through the sheer hell of being a teenager (says the kid who turns 20 at the end of the month). Grace Lee Whitney has the chance to bring out even more of the vulnerability of Rand that we saw in “The Enemy Within” and that was nice to see. William Shatner also has some pretty funny, awkward scenes as Kirk is placed in the unenviable position of being Charlie’s father figure, and eventually, his opposing force. That aside, this is a pretty well-done episode. Well worth it.